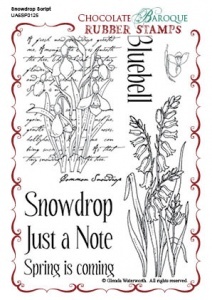 This rubber stamp set contains an image of snowdrops against a background of script, a stem of bluebells, a single snowdrop flower and several words and phrases. A charming little set that is suitable for a variety of occasions. I love snowdrops and have many rubber stamps featuring them but this is one of the best. Having the script behind the flowers gives it that little extra interest. Wish snowdrops could be a feature all year round. As for the bluebells this is another lovely design and takes so little colouring to bring it to life. Thank you Glenda.